Chicken Divan is a chicken casserole usually served with broccoli, almonds, and Mornay sauce. It was named after the place of its invention, the Divan Parisienne Restaurant in the New York City Chatham Hotel where it was served as the signature dish in the early twentieth century. Its creator was a chef named Lagasi. In French, the word divan refers to a meeting place or great hall. iFood.tv says it "was originally made by the chefs of the Divan Parisien restaurant of the New York Chatham Hotel. It is considered that the dish was given this name to imply elegance and attract attention of the restaurant's owners. It was a signature dish of the restaurant in the early twentieth century, though the exact chefs who contributed to its making are not known. But we do know the chef who created the dish. His name was Anthony Lagasi, and he received an award from the hotel for the creation of the dish." ^ a b Villas, James (2003). Crazy for Casseroles. The Harvard Common Press. ISBN 978-1-55832-217-2. Retrieved 2008-07-17. 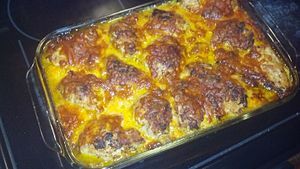 ^ "Chicken Divan Recipe". totalrecipesearch.com. 15 January 2015. Archived from the original on 16 March 2015.